Last time I mentioned my fitness routine and talked about how I was switching it up from just running to getting back into the gym, I didn't include the fact that I was joining the Air National Guard the next day. So yeah, little detail... I kind of left it out. Anyway, the biggest reason why I've backed off from the long-distance running—besides for trying to heal my body after the marathon two months ago—is to get better in shape for Basic Military Training (BMT). In Basic, it's not just running—it's push-ups, sit-ups, pull-ups, squats, flutter kicks, calisthenics, sprints, obstacle courses, and exercises that I don't even have any idea about... I have to be ready for anything. Down at BMT, before you are able to graduate, you must perform a fitness test. 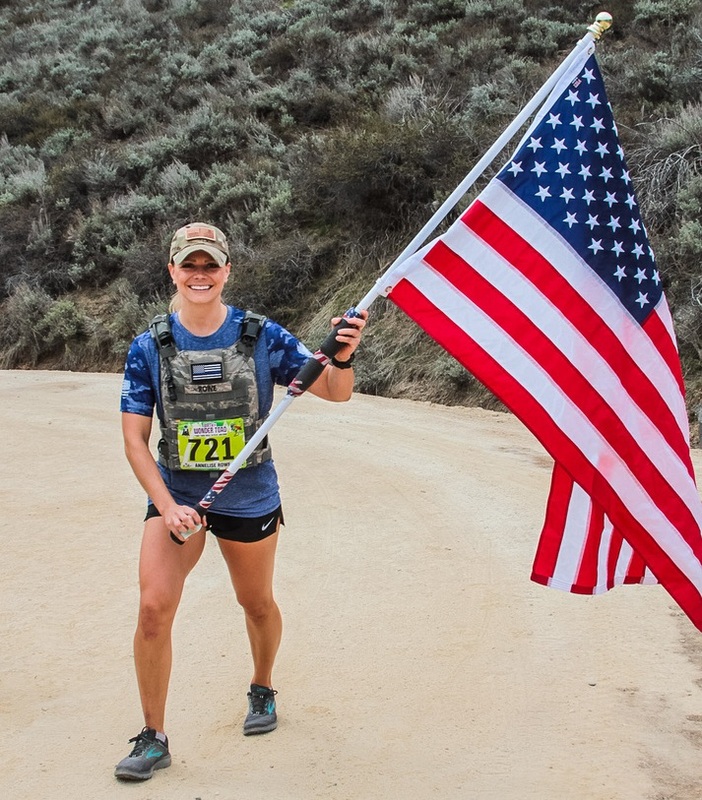 There are three levels you can achieve, the Liberator (the minimum graduation requirements), the Thunderbolt (honor graduate minimum standards), and the Warhawk (the highest fitness standard). If you guessed I'd go for the Warhawk, you would be correct. Here's a breakdown of the standards you have to meet for each category (as of 18 July 2014). This past Saturday, I put myself to the test, doing the push-ups & sit-ups inside, and then heading outdoors for the run—I had to run in the snow and it was cold and icy! I was able to do 55 push-ups, 65 sit-ups, and I finished my run in 10:53 (I did the pull-ups at the gym last week and was able to get 4). One thing is for certain, I may be right on the bubble of the Warhawk standards—but I need to keep working hard to maintain these numbers and decrease my run time! I am very excited that I have this measurement guide to train towards, because it's giving me some good inspiration to get in the best Basic Training shape possible. At the gym, I've been mixing it up each day. I tend to stick to more high-intensity workouts that involve each of the above exercises, as well as jumping rope, jump squats, lunges, mountain climbers, burpees (and burpee pull-ups! ), triceps dips, planks, crunches, and honestly... anything I can think of. It changes every time. I'm looking at these fitness standards like any other goal I've set for myself. Train, train, train and make it happen. As of February 12, 2014, I can now do 50 push-ups (my number is less but my form is better! ), 60 sit-ups, my run time is 10:13, and I can now do 10 pull-ups. Little by little, I'm improving! 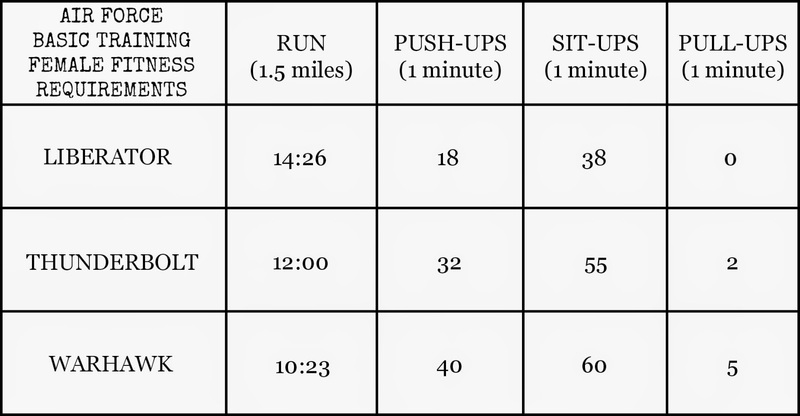 As of March 2, 2014, I tested and completed 46 push-ups, 66 sit-ups, my run time is 10:00, and I achieved 6 pull-ups. As of April 6, 2014, I tested at Student Flight and completed 43 push-ups, 62 sit-ups, my run time is 9:32, and I can now do 10 pull-ups. Basic Training, here we come! I ended up finishing BMT with PT scores of: 54 pull-ups, 68 sit-ups, 7 pull-ups, and a run time of 8:42—BMT's 5th fastest female time in their history! I achieved Warhawk and the Top PT award. It was an honor! You can read more about my final PT scores and the Top PT award here! Wow. 55 push ups in one minute? Dang. I think I could maybe do 10-15 before being exhausted. You are easily gonna make warhawk. And look at you shooting for the air force. You are so inspiring! This is awesome and I am highly impressed!! Wow that is awesome. You have fitness down. Way better then me thats for sure. Though I can't wait to get my foot healed and head out and do anything but sit. I can do 55 push-ups but the Army gives us two minutes to do them - don't think I could do that in one minute! You are awesome! Oh my goodness. You are a warrior! Before you even mentioned the warhawk level, I figured you'd go for the best! haha good luck, you should post some of your workouts! I tend to do the same thing over and over again, so I'd love some new ideas! That's awesome! Keep up the training! I kinda want to go time myself now to see what I can do! I appreciate every single cheer you give, thanks Kym! Ha! The secret is going very, very fast. If I rest, I tire out like nobody's business. I can usually make it to about 35-40 before I begin to get a little tired. But trust me, the faster, the better! Thanks, Shannon! I'm no Spartan, but I'll take a Warhawk! It will be so good to get it healed up, quick! Heal up, foot! I bet you could if you went super-quick! I don't know how you do a 2-minute challenge. I would get very, very fatigued. I feel like the Air Force makes you go SO QUICKLY... almost like they don't give you enough time, but with the 2-minutes I would be dead by the end of it. You should! Let me know what you do... I know you'll do great. That's the best! I'd want to meet these standards, too, even if I wasn't going into the Guard! Lol giiiirl, you got this. And that's so great you're training ahead of time. You'll thank yourself when your flight is getting "beat". MTIs love flutterkicks and push-ups as punishment, that's for sure. Even if you don't train, their PT will get you right for that test. I went in able to do maybe 5 correct push ups, and I graduated doing 30+ pretty easily. Hope you're ready for 5AM formations! Ick! Right? Good news though I can walk. Truly walk on it! First time in months. Oh my gosh Aunie, you've got some serious "balls" (can I say that?) to be able to do all of this! I'm so proud of you! Wow! Kudos! I would never be able to do that! Might as well go for the gold (Warhawk), right! You'll do it and with ease, I'm sure :) Good for you for being so motivated! Oh thanks, Sarah! I really appreciate that! How long before you leave for BMT? HUA! fellow blogger and ex Airforce activie duty here stopping to show some love and to wish you good luck! Sueannie--thank you so much!!! How long ago were you in the USAF? Did you enjoy your time? Thanks so much for all your service for our country! Just one more reason why you ABSOLUTELY ROCK, my awesome-sauce friend! :) Of course you would strive to be the best! :) Not surprised AT ALL that you are already able to do all of this. Gayle, thank you so much!!! I have absolutely no idea what it would be like for you to try to do push-ups. I didn't even think of that. You are a rockstar, for how fit you are though! Seriously. I look up to you & your perseverance so much. Thank you, Gayle! Awesome job in BMT, Aunie! With the push-ups and sit-ups, is it measured within a one-minute or two-minute time scale? Like, how many can you do within one minute? Also, with push-ups, are you allowed to rest or do you have to maintain the plank position? Congratulations! I have recently joined the Air Guard to and am striving for the Warhawk status, I will leave for basic sometime in August, it was great to read your story I hope I am as successful as you!